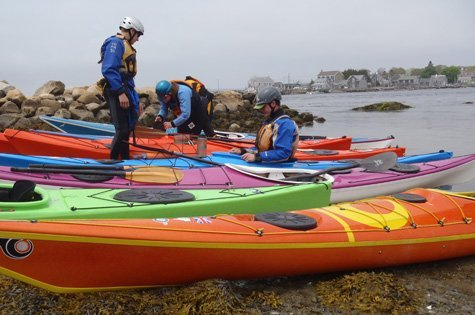 We run an extensive instructional program that covers all facets of sea kayaking. No one becomes a competent paddler after just one course; it takes time and training to learn the skills and to begin understanding the many moods of the sea. Each of our courses focuses on different aspects of the sport, allowing you to take your safety, strokes, and rescue skills into different water environments. We also provide private instruction so that you may practice and brush up on newly acquired skills. You can find our scheduled class times on our 2017 season calendar. To sign up for a course, contact us via the ONLINE REGISTRATION FORM, or email us at registration@ospreyseaandsurf.com. We will contact you about course details as soon as possible. Liability Waiver Form – The liability waiver form must be read and signed by all adult participants (18+). Minors (under 18) need to have a liability waiver signed by a parent or legal guardian. Please note that all participants interested in instruction must meet the ACA Essential Eligibility Criteria. If you have any questions regarding the Essential Eligibility Criteria, please contact the shop at steve@ospreyseaandsurf.com or call the shop line at 508-636-0300. Any cancelation on behalf of the shop will be made with the safety of the client in mind. Our lessons are not canceled for fog, rain or a chilly day. We will cancel if the conditions are not suitable for paddling (lightning, strong winds or extreme weather). In the event of a cancellation, we will contact all participants in a timely fashion. For regularly scheduled programming, If the shop cancels a course for any reason, you are entitled to a full refund. If you cancel, the shop will do the following: Provided one week notice, you will be issued a full refund; Provided 48 hours, we can transfer your payment to another trip; Provided less than 48 hours, you are not entitled to a refund or a transfer of any kind. For ACA, BCU or Specialty Clinics, A client can cancel and receive a full refund given 30 days notice, minus a $25.00 office fee. You will not receive a refund if you cancel less than 30 days prior of the class date, unless we can fill your spot, in which case you get a full refund minus the $25.00 office fee.